Duke Energy Corporation headquartered in Charlotte, North Carolina, is an electric power holding company in the United States, with assets also in Canada and Latin America. 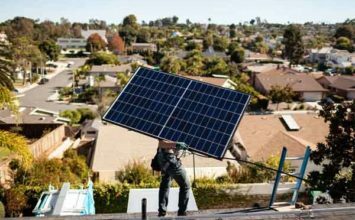 CHARLOTTE, N.C., Oct. 29, 2018 — Duke Energy wants non-residential customers to have another option to install solar power on their premises. The company recently filed to be a certified solar lessor with the North Carolina Utilities Commission (NCUC). Duke Energy Clean Energy Resources (DECER), a non-regulated affiliate of Duke Energy, will build, own and operate on-site solar facilities that will allow customers to access renewable energy without a large upfront investment. DECER is not financially supported by either Duke Energy Carolinas or Duke Energy Progress, Duke Energy’s operating companies in the Carolinas. Caldwell added that DECER will target businesses, and will mainly use local solar construction and maintenance companies to work on projects. Residential, commercial and nonprofit customers can still take advantage of Duke Energy’s $62 million solar rebate program, which has four more years left to help North Carolina customers with solar installations. Under DECER’s offering, companies can negotiate for solar facilities up to 1 megawatt of capacity – roughly 100 times the size of a typical residential home system. The agreement will have a term of up to 20 years. Customers will be able to use 100 percent of the electrical output of the facilities and be eligible for any rebates and net-metering options offered by Duke Energy. DECER will handle all the ongoing maintenance of the facilities. The ability to offer such services was included in last year’s Competitive Energy Solutions for North Carolina law – also known as HB 589. Before beginning operation in North Carolina, Duke Energy must receive approval from the NCUC. Complete details of the NCUC filing can be found here. Duke Energy can already offer such services in South Carolina. Duke Energy is one of the largest renewable energy companies in the nation, owning and operating more than 20 wind farms and 80 solar facilities – with 35 of them in North Carolina. The company’s efforts have led North Carolina to be the No. 2 ranked state in the nation for solar power. South Carolina was one of the 10 fastest-growing states for solar in 2017.